The floor covering of a terrace is exposed to different weather conditions. Be it a playground or a barbecue party - the rugs have to endure a lot. If the terrace is to become more beautiful, rugs are a great way to shape the floor. The type of use plays a decisive role in the selection of suitable flooring. So-called outdoor rugs are specially designed for outdoor use. The multipurpose fabric is available in different colors and patterns. It is suitable for terraces as well as for use on the balcony. Special system tiles for sticking are a practical covering for the terrace. The temperature-resistant material is available in different tile sizes and colors. Special subspecies are elastic sheets and tiles made of a softer material. Artificial grass as a surface for terraces and balconies is becoming increasingly popular. The natural-looking lawn carpet can be purchased in various designs such as low and high pile. Furthermore, there is the artificial lawn in many different shades. Wood does not necessarily have to be laid in plank form. So-called wooden gratings are available as rolls for laying out. Originally designed for garden paths, they are also suitable as a covering for the balcony and the terrace. Outdoor carpets are very robust and weatherproof. With a carpet knife, the knitted fabric can be trimmed and laid in angled areas. Most coverings are made of a jacketed backing fabric and feel soft and comfortable on appearance. Thanks to a grid-like mesh, dirt falls through and the lay-up goods are easy to keep clean. The practical system tiles convince with their simple installation technique without tools. The material is easy to clean by suction and rinsing. The surface looks sober, a cozy atmosphere like an artificial turf or carpet does not arise. Elastic panels are especially suitable for the area in which children play. The elastic surface is comparable in texture to a rubber mat. It offers increased fall protection. The sturdy panels are just as resistant to a tricycle race as they are to children's water pistol fights. A lawn carpet creates a natural atmosphere on the patio. In contrast to other rubbers, artificial turf is more intensive care. Instead of wiping the surface, it must be brushed regularly. If hot coal falls down during grilling, smelting can occur. Wooden goods can be laid quickly and easily. Especially in rental apartments, the solution is to beautify the balcony temporarily. The material gives a homely character and is very easy to care for. The covering is rolled up in minutes without leaving any residue on the substrate. The cost of a new covering depends on different factors. The total cost will be lower if there is already a substructure of the terrace. If additional components such as baseboards are required for edging or because of the shape of the terrace a lot of cutting is made, this increases the costs. A decisive criterion for the final price is the material of the parquets. Simple carpeting such as system tiles cost less than a high quality synthetic carpet. The prices start at five euros per square meter and reach up to a basic price of 50 euros per square meter. 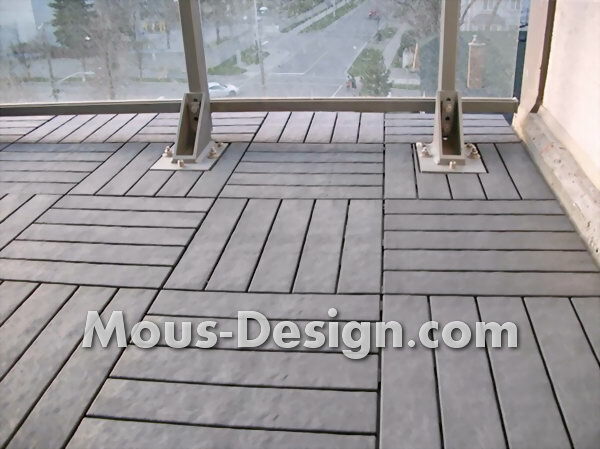 There are numerous types and possibilities for the design of the floor covering on the terrace and on the balcony. In addition to the functionality and the price, the decisive factor is the individual taste of the buyer. From a naturally acting surface such as artificial turf to functional elastic panels, all options are open. Seal the balcony: what does it cost? We answer these and many other questions in our price radar on the subject of balconies. Terrace build: what does it cost? Terrace seal: what does it cost? Renovate the terrace: what does it cost? We answer these and many other questions in the price radar around the topic of terrace renovation. Add a balcony: what does it cost? Renovate the balcony: what does it cost? Laying natural stone tiles: what does it cost? The We answer many other questions in the price radar around the topic of natural stone tiles. Laying terrazzo flooring: what does it cost? These and many other questions we answer in the price radar around the topic of terrazzo flooring.